Serevan’s way: rub the beets with a very small amount of oil, season them with salt, place them in an oven-proof pan, scatter a few of your favorite spices — these will be the flavors you want to infuse your beets with — cover tightly with foil and bake in a 300-350 oven until the beets are tender. The slower they roast, the more the sugars develop. My way: wash and cut the beets, leaving about 1” of the stems (supposedly keeps them from bleeding, not sure if anything keeps them from bleeding!). Preheat the oven to 350 degrees. Take a good-sized piece of aluminum foil and put the beets on it. Sprinkle with olive oil and salt. Inspired by Serge, I also sprinkled them with a little white balsamic vinegar, tossed in about 4 whole cloves and about ½ teaspoon of cumin seeds. Seal the foil and bake for about 1 ½ hours until the beets are fork-tender. 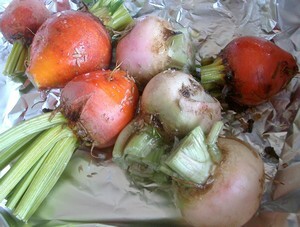 When the beets have cooled, cut the tops off and peel (the skins should slide right off). Slice them and use for salad. Next post: The Accidental Locavore-Back In Business With a New Farm Box!